Leicester City winger Riyad Mahrez has handed in a transfer request but the club have no interest in selling him before the transfer deadline. It is understood Manchester City have made a bid of around £50m for the 26-year-old Algeria international. However, that figure falls far short of Leicester's valuation. Asked about his interest in Mahrez, Manchester City boss Pep Guardiola said: "Right now, it's not the place to talk about it. It's so difficult." The Spaniard added: "It happened with (Aymeric) Laporte because it's a buy-out clause. When you have to negotiate it's always so complicated." Guardiola confirmed that City will be without Leroy Sane for six or seven weeks due to the ligament injury he sustained at Cardiff on Sunday. Earlier this month, City backed away from an attempt to sign Alexis Sanchez from Arsenal as the overall financial package had exceeded what they were willing to pay. With Brazil forward Gabriel Jesus already injured, Guardiola feels his attacking options are too stretched and that Mahrez would fill them. "I have interest in a lot of players, good players, there are many, the window is open until the 31st," said Guardiola. "We spoke many times with the club to see what is the best with the players we have. Right now we have just three strikers with Raheem (Sterling), for the next month or month and a half. "Gabriel is coming maybe in the next five or six weeks, we don't have too much and we play every three days. We have to find solutions." Mahrez has a long-standing desire to join a bigger club and spent the 31 August deadline in a Paris airport waiting for a deal that never materialised. 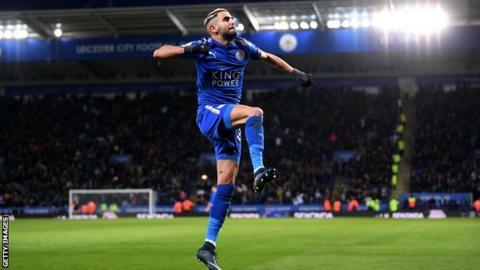 He asked to leave Leicester last May and Italian club Roma had three bids rejected but Mahrez has continued to be linked with a move away from King Power Stadium. The winger signed a new four-year contract with the Foxes in 2016, after helping them to their remarkable title triumph and being voted the PFA Player of the Year. Leicester manager Claude Puel said earlier this month that talk of him leaving was speculation and suggested Mahrez was happy to stay with the club. "It is always the same thing about Riyad," he said. "It is just rumours, noise about him and other players. "We can see Riyad smiling and enjoying his football and enjoying playing with his team-mates - and it is the same in training." Mahrez joined Leicester from French club Le Havre for a reported £400,000 in 2014. He has scored eight goals in 24 league games this season. Read more on Transfer deadline day: Who will Arsenal, Liverpool, Chelsea, West Ham look to sign?